In March 2011 a magnitude 9 earthquake struck off the eastern coast of northern Japan, triggering a massive tsunami and damaging a nearby nuclear reactor. Nearly twenty thousand people were killed or went missing, and many areas have yet to rebuild. Unfortunately, due to sales rights restrictions, we cannot offer Megaquake for sale in your country. In March 2011 a magnitude 9 earthquake struck off the eastern coast of northern Japan, triggering a massive tsunami and damaging a nearby nuclear reactor. Nearly twenty thousand people were killed or went missing, and many areas have yet to rebuild. 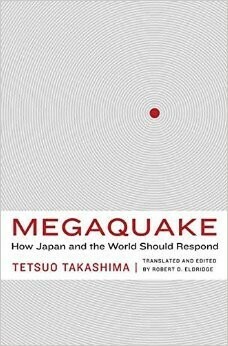 Megaquake: How Japan and the World Should Respond, written by the prolific and award-winning writer Tetsuo Takashima five years before this disaster, appears here for the first time in English. This edition of Megaquake has been updated with additional information, including a new chapter coauthored by Robert D. Eldridge, translator and one of the key American officials involved in the response to the 2011 earthquake. Both Takashima and Eldridge experienced the 1995 Kobe earthquake and combined their skills and insights to produce this English edition to offer the lessons Japan has learned over the centuries, having endured a disproportionate share of disasters. Takashima and Eldridge hope to educate the international community about how to prepare for and respond to the next big Japanese earthquake, which is expected to far exceed the 2011 quake in terms of lost lives, destruction of infrastructure, and worldwide economic impact.